Golden rod (Solidago canadensis or Solidago altissima) indicating the transition from summer to fall. Goldenrod is a pleasant-tasting tea for upper respiratory infections and sinus infections, and can prevent colds and flu. From late August through September, fields and roadsides turn golden yellow, which marks a kind of fifth season between the end of summer and the beginning of fall. It’s the season of goldenrod. A way to celebrate this fifth season is by preparing a cup of relaxing, goldenrod tea, which also is a great preparation for the cold and flu season. Readers might get anxious at the thought of celebrating goldenrod season, since it’s mistaken as a common allergen. The culprit of hayfever is ragweed, which has inconspicuous green flowers and grows near goldenrod. Making a goldenrod tea can actually help soothe the inflammation of allergic rhinitis, itchy eyes and respiratory congestion associated with hayfever. Although many species of goldenrod are native to North America, the most common goldenrod species in the Southeast are Canada goldenrod (Solidago canadensis, or S. altissima) and anise-scented goldenrod (S. odora). Canada goldenrod has triangular-shaped plumes of inflorescense, and sometimes the flowers stand upright along the arching stems. Anise-scented goldenrod blooms only on one side of the stem, and smells like anise or licorice when you crush the leaves. Botanists confess that identifying goldenrod species is a challenge. Thankfully, all Solidago species can be used safely; however, S. canadensis and S. odora are more medicinal than others. Before they bloom, they look like nondescript weeds with many lance-shaped leaves traveling up the entire stem, which grow between 1 and 5 feet tall. Sometimes in the top third of the stems a growth forms, looking like a snake that’s swallowed an egg. Called a gall, it’s created by insects laying their eggs in goldenrod. Native Americans used goldenrod for multiple ailments. The leaves commonly were crushed in a mortar and pestle and applied to burns, boils or skin ulcers. After the flowers dried, the seeds were collected for food. 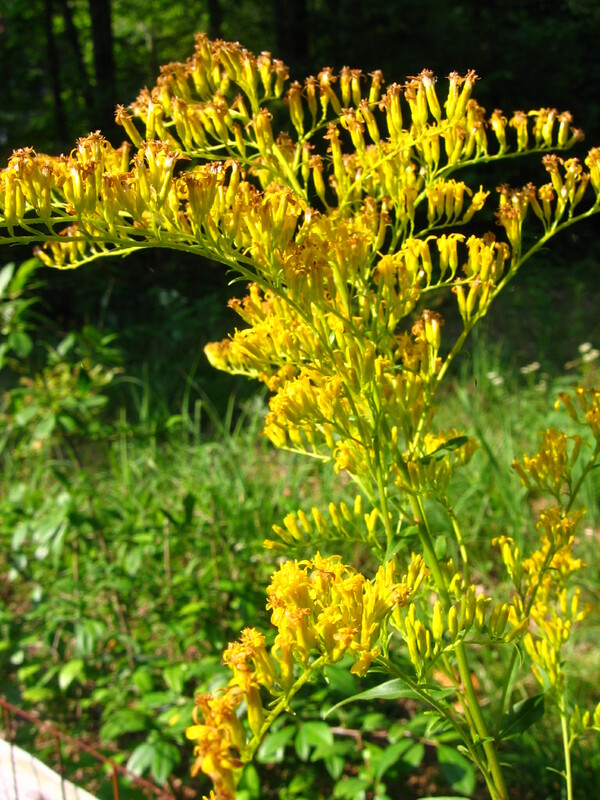 For political, economic or accessibility reasons, European-Americans have historically turned to goldenrod as a substitute for English-imported black teas (Camilla senensis). After the Boston Tea Party, English tea was boycotted, and goldenrod was one of the American plants substituted; hence, a common name for goldenrod is Liberty Tea. Or, it could have been Liber-Tea. The anise-scented goldenrod had a run in popularity in the Eastern U.S. during the 19th century. At the time it was called Blue Mountain Tea, and was even exported to China. At other times, goldenrod was substituted when English teas were difficult to obtain, such as during the Civil War. The substitution wasn’t a sacrifice. Goldenrod makes a pleasant-tasting tea with mild sedative properties, and serves as a tonic for the respiratory system and urinary tract. Its antibacterial actions help to prevent or address sore throats, upper respiratory or urinary tract infections. Also, goldenrod is a wonderful tonic for people prone to kidney stones. One may use goldenrod as a preventative or to dissolve existing stones, most appreciated by those with experience. Celebrate goldenrod season with a lovely tonic tea. Cut the goldenrod stem just above any browning leaves. For fresh leaf tea, turn the stem upside down and strip the leaves and flowers into a bowl. Compost the stems. Chop the leaves and flowers, and steep, covered, two tablespoons of fresh goldenrod in a cup of boiling water for 20-30 minutes. To dry goldenrod for later, bundle 3 stems and hang in a dry, ventilated area. Once dry, strip the leaves into brown paper bags and store in a cool, dry, dark place. Steep one tablespoon of dry goldenrod in a cup of boiling water for the same amount of time. Drink 3 cups a day as an upper respiratory preventative, or in an acute infection drink as often as every 3 hours. The above article originally appeared in the Athens Banner-Herald on August 22, 2010.